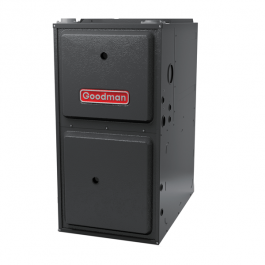 The Goodman GMSS92 Gas Furnace with single-stage gas valve and a multi-speed circulating blower provides efficient and economical performance. A single-stage gas furnace provides more consistent airflow through constant rotation. Energy efficiency is key to controlling the cost of heating your home. The 92% AFUE rating on this gas furnace means that 92 cents of every $1.00 of heating energy expense warms your home. Some older central heating systems are rated at 60% AFUE. The Department of Energy (DOE) established the AFUE, Annual Fuel Utilization Efficiency, system to calculate the annual operating cost of residential gas furnaces. 1 i am having this Goodman purchased from you and looking for the matching Goodman Vertical Cased Coil (2 ton)? Answer Hello John, please provide us with a model number of your current condenser and we can try and match it with the correct matching vertical coil. Please contact us at 888-474-9966 with any further questions.